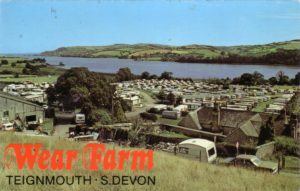 A summary of the occupiers of Wear Farm, Newton Road, Bishopsteignton, taken from the official parish records. 1338 In a Feet of Fines at York William de la Ware and Isabella his wife and Henry de Hugheton with his wife pleads relating to land at Teignton Episcopi, Bremridge, Gredyton and Teynemouth. Thus is probably a marriage portion for one of the family. De Hugheton was a well known merchant in Exeter. 1524 The Devon Subsidy Roll names John Babbe at Were, Junior with fair agricultural income. 1558 The Burial Register records the burial of John Babbe at Weare on 5 January. 1617 Cleland states that the Pidsley family acquired Ware around this date. 1641 The Devon Protestation Return show John Pidsley senior and John Pidsley junior signing the return. 1674 The Hearth Tax Return shows Jon Pedley (Pidsley) with four hearths, though no holding name. 1703 The Burial Register records the burial of Mrs Margery Pidsley, old virgin of Ware. 1706 Ware was occupied by Charles Pidsley and his wife. 1714 The Baptism Register Records the baptism of Edward the son of Mr Charles and Joan Pidsley of Ware. 1730 The occupant was John Pidsley who died in 1769. 1737 John Comyns married Mrs Charles Pidsley, widow. 1736 The list of Sir John Lear’s debts shows John Pidsley as tenant at Ware. 1752 The Churchwardens’ records show that John Pidsley gent was churchwarden for Ware. 1770 The Baptism Register records the baptism of Elizabeth the daughter of John and Grace Taylor of Ware. 1773 The Churchwardens’ Records show that William Waye was churchwarden ‘deputy for Charles Pidsley gent for Ware’. 1793 The Burial Register records the burial of Mrs Elizabeth Pidsley of Ware aged 74. 1794 The Burial Register records the burial of Carolus Salter, son of John Pidsley and Marianne of Ware aged 7 months. 1795 The Burial Register records the burial of Mr Charles Pidesley of Ware aged 73. 1792 The Land Tax Register shows Charles Pidsley own and George Paddon occupies Ware. 1799 The Baptism Register records the baptism of Susannah, daughter of William and Anne Cornish of Wear. 1828 The Land Tax Assessment shows that John Pidsley owns Wear and that William Rossiter is tenant. 1833 The Voters’ List shows William Rossiter rents Wear from John Pidsley of Exeter. 1851 The Census shows William Rossiter occupies Wear, aged 67. The acreage is 139. 1856 The Post Office Directory shows William Rossiter as farmer at Wear. 1857 The Baptism Register Records the baptism of Samuel Carter Rossiter Ware. 1865 The Burial Register records the burial of William Rossister of Wear. 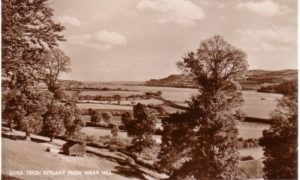 He had lived in Bishopsteignton for nearly 50 years. 1870. Morris’ Directory shows Mrs Rossiter occupies Wear. 1886 The Baptism Register records the baptism of a child of Andrew Cornish Hall and Mary Lavinia Hall. 1890 White’s Directory shows Andrew Cornish Hall is farmer at Ware Farm. 1904 Charles Stooke bought the farm. 1914 Kelly’s Directory shows Charles Stooke, farmer at Ware. 1919 Kelly’s Directory shows John Parnell Tucker as farmer at Ware. 1926 Kelly’s Directory shows John Coaker and Sons, farmers at Ware. 1935 Kelly’s Directory shows John Coaker as farmer at Wear. 1935 A newspaper cutting records the sale of Ware Farm, late the property of Mr John Coaker. The purchaser was Mr D Wrayford. 1939 Kelly’s Directory shows the occupier of Wear Farm was William S Coaker. 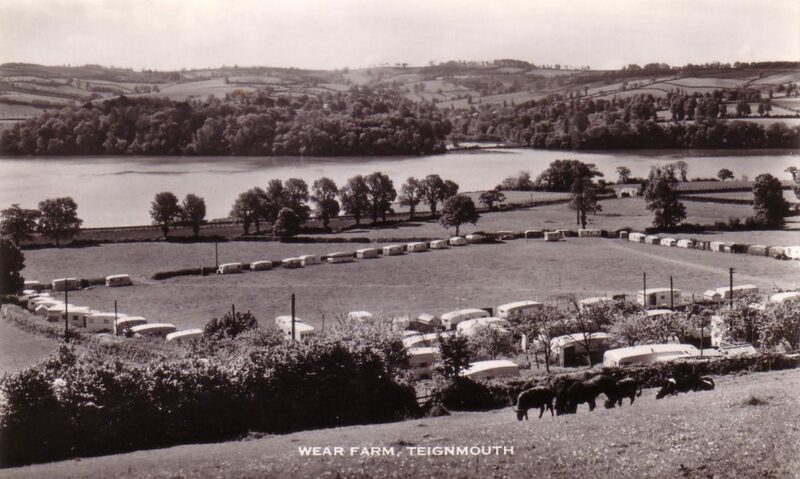 Wear Farm, Bishopsteignton circa 1960? Do you have any other information on Wear Farm or its owners? If you would like to subscribe and leave a comment, please see the link below. Photographs courtesy of the collection of Greg the Postie.